In Padre Pio’s presence, one felt that nothing on this earth was of any importance except one thing, to be in the grace of God. As a confessor, Padre Pio wanted people to understand the seriousness of sin. “We have a greater fear of mortal sin than of fire,” Padre Pio once said. On another occasion he said, “Beware of sin as of a poisonous viper.” When penitents put questions to him regarding moral issues, his answers left no doubt as to the difference between right and wrong and the proper course to follow. One man said, “Padre Pio’s words were firm, candid and pure.” A man once confessed to him that he had thoughts against chastity. “How many times have you had those thoughts?” Padre Pio asked. “Six or seven times,” the man replied. “But seven is not the same as six because it means one more deadly sin,” Padre Pio answered. The thought of going astray and . . . offending God fills me with terror. It paralyzes my limbs, and both body and soul feel as if they are being squeezed in a powerful vise. My bones feel as if they are being dislocated . . . crushed and ground up. In the confessional, Padre Pio did not want people to make excuses for their sins and omissions. A woman from Gioia del Colle, Italy visited Padre Pio on one occasion. During her confession, she said that she missed Mass the previous Sunday because of the rain. “Yes, but when you left to come to San Giovanni Rotondo, it was raining too,” Padre Pio replied. “You must never miss Mass again on Sunday unless illness prevents you from attending,” he added. 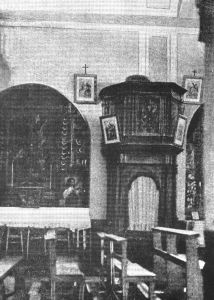 A photo of the confessional used by Padre Pio in the early days. Mr. Livio Dimatteo met Padre Pio in 1959. On one occasion, Livio had been undergoing a strong temptation which he was convinced was, “from the devil.” Because of it, he was afraid to make his confession to Padre Pio. When he finally gathered up the courage and entered Padre Pio’s confessional, Padre Pio placed his hand, much harder than usual, on Livio’s head. Livio was certain that Padre Pio knew all about the temptation and would assist him through his prayers. One man who had initially been denied absolution by Padre Pio stated that Padre Pio was the only person who had been able to help him break away from his destructive lifestyle. “Thanks to Padre Pio, I was able to understand the gravity of my sins,” the man said. Previously, the man had always justified his immoral conduct and had no desire to change. People tried to show him the error of his ways but nothing that anyone said made a difference to him. The shock of being denied absolution by Padre Pio caused the him to reflect on his life. He made a good examination of conscience and later made a sincere confession and received absolution. I was expecting to see a saint but I never imagined I would experience what I did. I told Padre Pio the many troubles of my family and myself and he listened paternally. I asked him for a grace for which I had waited many years for in vain. “Men can do nothing my son,” Padre Pio said and he pointed upward. “Only God who is above can help us. I will pray for you,” he added. He then gave me his blessing. I cannot describe to you the feeling of profound emotion I felt, so much so that when I got up, I lost my balance. He touched me affectionately on the right side of my head. My right ear, in which I was completely deaf, suddenly opened and I have been able to hear perfectly ever since. Padre Pio insisted that people dress modestly whenever entering the church to attend Mass or to make their confession. To many, his standards of modesty were considered to be extreme. As time passed, Padre Pio became even stricter regarding church attire. One priest, who knew of Padre Pio’s rigid standards, told him that he could not insist on such a strict dress code in his parish because he feared that the members of his congregation would become angry and quit. “An empty church is better than a profaned one,” Padre Pio replied. Padre Pio’s fidelity to his priestly ministry as a confessor was revealed to Dr. Filippo Pancaro on one occasion. Dr. Pancaro, who was on staff at the Home for the Relief of Suffering, once gave Padre Pio a thorough physical examination. Besides having a high fever, Padre Pio also complained of dizziness, weakness, and a disturbing ringing in his ears. His exhaustion at the time was so great that he could hardly stand on his feet. Dr. Pancaro told Padre Pio that he needed to rest more in order to regain his strength. He advised him to discontinue hearing the evening confessions for a while. Padre Pio was very disappointed at the doctor’s words. “If that is an order, I will do it,” Padre Pio said. “But only if it is an order. I do not want to cut back on hearing confessions.” Padre Pio then asked the doctor for his prayers. “I ask you to pray for me to the Virgin Mary,” Padre Pio said. “Pray that my health will be restored.” Dr. Pancaro assured him that he would do so. Padre Pio told the doctor that if he had a choice between losing his sight or his hearing, he would prefer to lose his sight. “As long as I have my hearing, I will always be able to continue to hear confessions,” he said. He once told Father Agostino that he would prefer to be taken to the confessional in a wheelchair rather than to stop hearing confessions. Gina Deiana was engaged to be married and was looking forward to the day of her wedding with great anticipation. Two months before the wedding, her fiancé broke up with her. He did not have the courtesy to speak to Gina in person about his decision or even to call her on the telephone. He simply left her a short note indicating that their relationship was over. Gina was devastated by his actions and sunk into a deep depression. Her sadness became so overwhelming that she lost all joy in living. Soon after the break up, Gina happened to read an article about Padre Pio in a magazine. She had a strong desire to visit Padre Pio and so she invited her aunt to make the trip with her to San Giovanni Rotondo. They left from their home in Genova, and arrived at Padre Pio’s monastery two days later. The year was 1952. They felt fortunate to book a room in the one and only hotel in the town. The following morning, Gina and her aunt attended Padre Pio’s early Mass. Later that day, a woman whom Gina had never seen before, approached her and said, “You are the girl whose fiancé broke up with her. Am I right about that?” “But how did you know?” Gina asked. “Padre Pio told me about you,” the woman answered. “He wants you to stay here in San Giovanni Rotondo longer than you had intended to. Also, he would like to speak to you.” “But our funds are very limited. We cannot afford to stay any longer than planned,” Gina said. “Don’t give it another thought. I will be happy to lend you the money,” the woman replied. The woman’s name was Angelina Serritelli. She was one of Padre Pio’s spiritual daughters and she went to great lengths to assist him in any way that she could. Gina was amazed by her conversation with Angelina Serritelli. She and her aunt were strangers in the little town of San Giovanni Rotondo. No one but Gina’s mother knew about their trip. But Padre Pio obviously knew that Gina was there. He had sent Angelina to greet her. Gina called her mother in Genova and told her that she and her aunt would be staying longer than they had anticipated. While in San Giovanni Rotondo, Gina was able to make her confession to Padre Pio. During the confession, she told Padre Pio that her fiancé had abandoned her and that she was very depressed. Although she had made an effort to get over the traumatic incident, she had not succeeded. She told Padre Pio that she had stopped receiving Holy Communion because she had been so upset. In a fatherly way, Padre Pio counseled Gina. “Be calm,” he said. “You must try to stop thinking about your fiancé and how he betrayed you. He was not worthy of you.” Gina felt at peace for the first time in a very long time. Padre Pio spoke to her with great tenderness, almost making light of the sins that she confessed. He then gave her a picture of Jesus. On the back of the picture, he had written the words, “Let Jesus be the center of all your aspirations.” After making her confession to Padre Pio, Gina was able to put the past behind her and move forward in life. 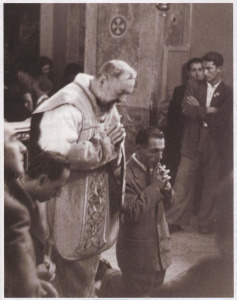 Guido Biondi visited San Giovanni Rotondo and made his confession to Padre Pio for the first time in 1956. In the confessional, Padre Pio asked Guido if he attended Mass on Sundays. Guido replied that he went to Mass once in awhile. “Then you must leave,” Padre Pio told him. “Come back in one month and I will hear your confession at that time,” Padre Pio added. Guido was angry when he rose from his kneeling position. He could hardly wait to get out of the confessional. He felt indignant and humiliated that Padre Pio had dismissed him in such a rough way. When he walked out of the church, he immediately went to the bus stop in order to catch the first bus that was leaving for Foggia. On the bus trip to Foggia, Guido’s anger began to subside. As he thought about what had transpired in the confessional, he became more objective. He was able to understand why Padre Pio had spoken to him the way he had. Guido took stock of his life, and for the first time, he felt guilty about many of the actions of his past. He had turned his back on God and in doing so, he had lost his way. He suddenly felt the crushing burden of his many sins. After Guido returned to his home, he went over every detail of his brief encounter with Padre Pio. He wanted with his whole heart to speak to Padre Pio again but he felt too embarrassed to do so. Padre Pio had rejected him and he did not feel that he could ever face him again. Guido had a very good job in the automobile industry where he was supervisor to more than one hundred employees. Back at work, he found it difficult to concentrate. He began to lose weight and his health deteriorated. He neglected his responsibilities at work. One day, he had great difficulty breathing. His body was wracked with pain. He prayed to Padre Pio and at once his painful symptoms disappeared. The answered prayer from Padre Pio gave him the courage to make a return trip to San Giovanni Rotondo. At the monastery of Our Lady of Grace, Guido noticed a Capuchin who greeted five men that were standing nearby. The Capuchin motioned for the men to follow him. What seemed to be a force outside himself impelled Guido to join the group of five men. They followed the Capuchin up some stairs and then down a long and narrow corridor. Suddenly, they were standing in front of Padre Pio’s cell. They knocked on the door and heard a loud voice inviting them to come in. Guido was the last one to enter Padre Pio’s cell. Padre Pio greeted the men and asked them for an update regarding someone who was ill. Guido understood then that the five men he had followed into Padre Pio’s cell were all doctors. They worked at the Home for the Relief of Suffering. One of the doctors spoke to Padre Pio at length about the individual who was ill. After the doctors conversed with Padre Pio for a while, one by one, they kissed his hand and then left. Guido was suddenly standing all alone with Padre Pio. Fear gripped his heart. Padre Pio smiled at him and offered him his hand. Very moved, Guido kissed Padre Pio’s hand and then left. Those few moments with Padre Pio had made a remarkable impression on Guido. He knew that it was no accident that he had followed the five doctors to Padre Pio’s cell. He was certain that it had been arranged by Divine Providence. That very evening, Guido had an opportunity to make his confession to Padre Pio. He no longer felt afraid. He was able to make a sincere confession. Padre Pio was very kind to him. He blessed him and gave him absolution. When Guido rose to his feet, he felt purified and immensely happy. Italian-born Dino Segre was a well-known and highly esteemed author. He took the name Pitigrilli as his signature name for all of his published works. Dino was talented and successful and had more money than he could spend. Although he was not religious, as time passed, Dino began to think more and more about the deeper meaning of life. In the process, his interest in spirituality gradually began to grow. At the advice of a friend, Dino decided to make a trip to San Giovanni Rotondo in order to see Padre Pio. Dino was famous throughout Italy but while he was visiting the monastery of Our Lady of Grace, he wanted to remain completely anonymous. He hoped that no one would recognize him. On the morning that he attended Padre Pio’s Mass, he sat in the very back of the church and tried to remain as inconspicuous as possible. Dino was thunderstruck by Padre Pio’s words. He was certain that Padre Pio was speaking about him. There was not a doubt in his mind. Dino felt as though his heart was breaking. He began to cry. Try as he might, it was impossible for him to stop the flood of tears. The encounter with Padre Pio marked a turning point in the life of Dino Segre. After he left San Giovanni Rotondo, he went to his publisher and insisted that certain books he had written be permanently taken off the market. He was aware that his decision would cause him to incur a great financial loss, but he didn’t care. He knew that Padre Pio set a very high moral and spiritual standard. With all his heart, he wanted his literary works to reflect that standard. For the rest of his life, he wrote only books that had a Christian theme, books that would help encourage others in the practice of their faith. I have been meditating on the story of the prodigal son. It is a story about returning. I realize the importance of returning over and over again. My life drifts away from God. I have to return. My heart moves away from my first love. I have to return. My mind wanders to strange images. I have to return. Returning is a lifelong struggle….God’s love does not require any explanations about why we are returning. God is glad to see us home and wants to give us all we desire, just for being home. . .so why delay? God is standing there with open arms, waiting to embrace me. He won’t ask any questions about my past. Just having me back is all he desires.